Cassius Clay Cummins was born on December 8, 1917. His father’s name was Milton Joseph Cummins and his mother was Ruth Kitchen (her maiden name). He grew up with two brothers Rudyard and Edward Cummins and one sister Jennie F. Cummins. When he was in his toddler years, he lived on Seventh Street, in Corbin, Kentucky. Later on,Cassius went to grammar classes, and completed his Freshman year in high school. On October 10, 1939 he enlisted in the Army at Fort Knox in Kentucky, his serial number was 06669774.. He is listed as W.S. Army which could mean -- Weapons School- Weather Squadron - or Workstation and was a Technician 5th Grade. He was killed in action on July 25,1944 serving with the 95th artillery Battalion, 5th armored division in France. He was 26 years old. 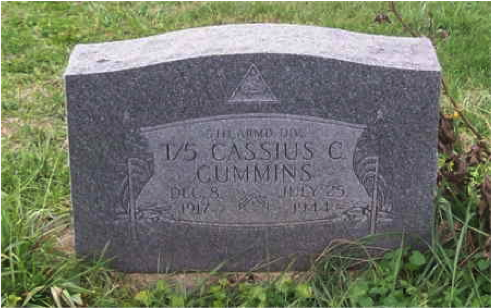 Cassius is buried at Corinth Cemetery in Corbin, Kentucky.Today, he still has living relatives in Clarksville Tennessee, and Lexington Kentucky.